A one-year look back at Allstar Weekend – Live! Starring ... You! Rebecca Wojcinski with Michael Martinez and Cameron Quiseng, formerly of Allstar Weekend and now of the Tragic Thrills. Editor’s note: One year ago, Rebecca Wojcinski made her debut as an LSY! 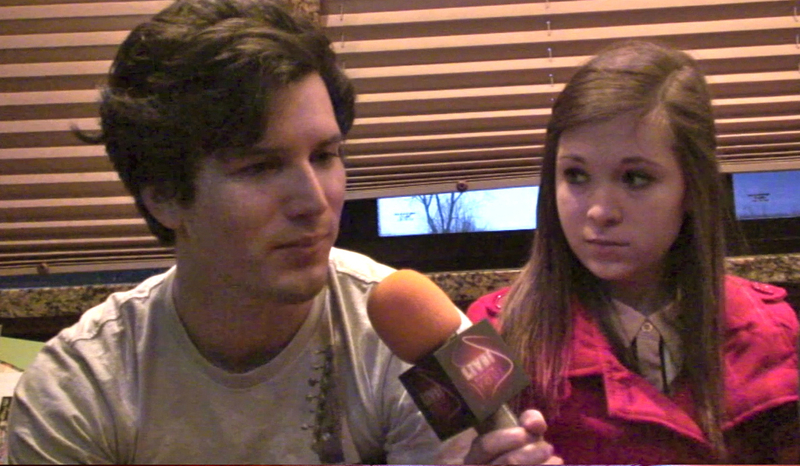 teen reporter interviewing her favorite band, Allstar Weekend. Much has changed since then for the band, and we asked Rebecca to reflect on the experience. For years I’d been hoping to meet my favorite band, Allstar Weekend. All I wanted to do was meet them, which was my dream. I could have never expected what was in store for me. Finally my dream came true. Not only was I going to meet the band, but I was going to interview them! I was so psyched I didn’t even know how to react. It was the weirdest mix of being nervous and being excited. Not the best mix, I must say. I really doubted that I would be able to keep everything inside. What would come out of my mouth? Was I going to cry when I saw them? Was I even going to be able to speak? All these questions and more were going through my mind when we were driving to the venue. The biggest thing going through my mind was that Live! Starring… You! had interviewed the band many times before, and my interview was most likely going to be the last with them, and here I was having a mini panic attack. “I cannot mess this up.” I told myself continuously. Live Starring… You! had their very first interview with Allstar Weekend in May of 2010. The interview was mainly getting to know the band. They were new to the world and not many people knew who they were yet. Allstar Weekend was discovered passing out flyers at a Jonas Brothers concert. A woman went up to the boys and asked for a flyer. The next day they got an email asking if they wanted to be entered in a Disney Channel music competition known as The Next Big Thing. Cameron Quiseng, bassist in Allstar Weekend, says, “I didn’t know we had fans in Buffalo, but we just sound checked and there were a couple girls screaming out there so I’m really excited about that.” Michael Martinez, drummer for the band, adds in, “It’s super hot right now so I wish we had more fans.” Allstar Weekend was the band that always made everyone laugh. In November 2010, Allstar Weekend came to Mount St. Mary’s for an after school concert. “It was so loud when we walked in the building that we couldn’t even hear each other speak.” Cameron says about coming to the school. “It definitely boosted our egos.” Nathan adds. The road wasn’t always so easy for these 4 boys. In the winter of 2011 we talked to them and the first thing they did was reenact when they used to pass out flyers at Jonas Brothers concerts. People did one of three things: they would take them and throw them out, take them and throw them on the ground, or simply just not take them. At the end of the day they found tons of their flyers in the trash bins. All this time the band had four members. Lead singer Zach Porter, bassist Cameron Quiseng, drummer Michael Martinez, and guitarist Nathan Darmody, made up Allstar Weekend. Before our interview in August 2011, something big happened to the band. Nathan had to go home for a family issue, but in the end, he never came back. Fans wondered what was going to happen to the band if they didn’t have a guitarist. Allstar Weekend got a substitute for that summer tour with Selena Gomez and then finally replaced Nathan with guitarist Brent Schneiders. Before Nathan left they had been cool, laid back guys, but after they became serious, very focused on their band and their music. That attitude continued into their next interview with us, which happened about a year later in August of 2012. They were very serious and didn’t laugh much at all. They answered questions straight and to the point. It’s weird how some days you go to school like it’s just a normal day, but something really strange happens that flips your whole world around. That happened to me in the beginning of February, when I had practically finished preparing for my interview. I walked into school and turned the corner and my friend screamed to me, “ALLSTAR WEEKEND IS BREAKING UP!” Naturally I thought she was messing with me until she showed me the note, straight from the band saying that after Warped Tour, Allstar Weekend would not exist. They simply stated that they had grown up since they started the band and were ready to move on. The boys, Michael, Cameron, Zach, and even Brent, were staying together but starting a brand new band with a different sound. This crushed me. The thing I was most worried about was my interview! Now I had to come up with all new questions, and I did. February 12, 2013 was the day my life changed. Not only was I going to meet them and interview them but the interview was on their tour bus! Zach Porter is the frontman of The Tragic Thrills and, formerly, AllStar Weekend. When it finally came time for the interview, as we were walking to their bus, I was shaking uncontrollably. I was literally freaking out inside while on the outside, I was trying to keep my cool (something that I didn’t have much of…). I was the third person to get on the bus — the third out of three people. We walked on the bus and all I could hear were their voices. The voices that I had heard a million times in songs and interviews online, I was now hearing in person. When I first saw them, it was one of the best feelings ever. Michael reached out his hand and introduced himself and I couldn’t believe I was actually about to shake hands with Michael Martinez. I managed… barely. I have had a huge celebrity crush on Cameron and I finally got to meet him and my first impression of him was that he was a ……hungry man. As soon as I looked at him, he was standing by the counter eating. Lovely. When I did the interview it was so strange being on their bus, especially when the summer before I made a plan to sneak on the bus. It was a good one too, but, fortunately, I didn’t need it. I was sitting on their bus about to do the interview. It was happening. Everything went well, but I was caught off guard when they turned around and started asking me questions. Not cool guys, not cool. When I walked off the bus after I gave them each a hug good-bye it was a feeling I can’t explain. I had just met the three boys I looked up to, and I had a signed iPod and a box of chocolates from Cameron to remember the amazing day. On August 4th, everything changed. Allstar Weekend official became The Tragic Thrills. Same band, same people, very different sound. They told me in February that their sound would be less pop and more organic and they couldn’t have been more right. Allstar Weekend will always be a wonderful thing that happened and I am looking forward to the future of the three boys who I came to know and love. Goodbye Allstar Weekend, hello Tragic Thrills. Click here to read Rebecca’s review of The Tragic Thrills’ new music.